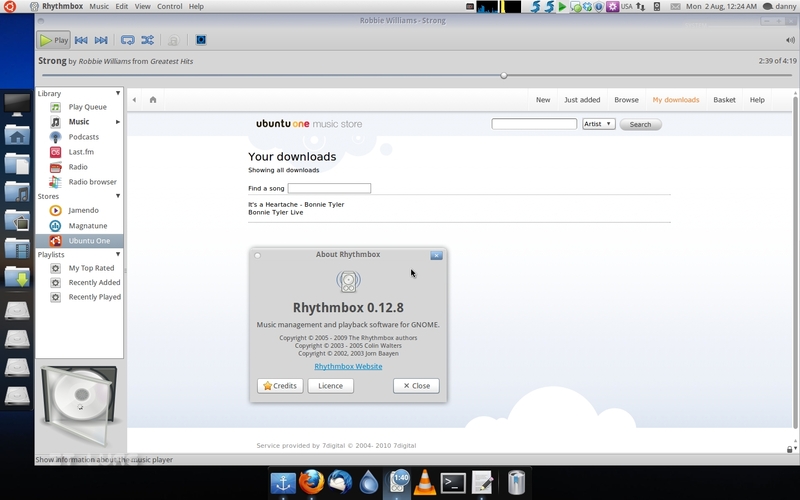 Yes, yes, ANOTHER Ubuntu based distribution... what can one do? Ignore them? No. Especially when they come with enough elements to make you consider choosing them instead of the "plain" Ubuntu. 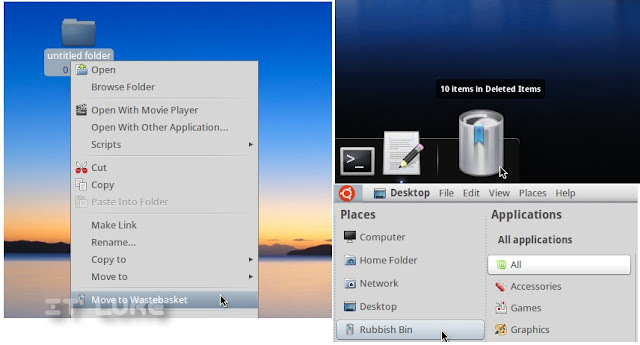 The thing is, if you are a regular user of all the applications and utilities bundled in Pinguy, you'll love it. If you are going to appreciate only a small percentage of them, then meh. But what I think Pinguy is great for is new users, particularly those that are hard to impress. I am very skeptical about these distributions that pour all kinds of ingredients into the mix, as even if each ingredient is great on its own, they are bound to give the finished product a horrible taste. But this is not the case. Pinguy feels surprisingly stable and fast. 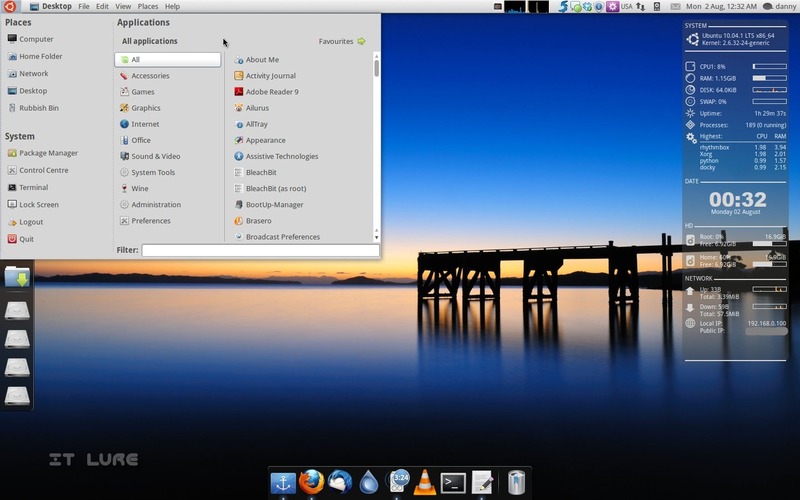 This OS is based on the latest release of Ubuntu - 10.04 - and comes with both 32- and 64-bit editions. Though usually I go with 32-bit, this time I decided to make good use of my hardware and install the more advanced version. As expected, the ISO is way over the CD limit, so you'll need a DVD; ~1.4 GB is enough for the 64-bit edition. It's interesting to add here that, initially, Pinguy was 64-bit only and, after several requests, the developer (a strong advocate of the 64 platform) decided to create a 32-bit one as well. I'm not to say which is better, but I have encountered absolutely no problems during my time with Pinguy, so why not make use of everything the hardware has to offer? Booting the Live environment was quick, but not enough to keep me from spinning with my chair until I got dizzy. I swiftly went through the installer routine (which, for some reason, removed the Mandriva partition from the bootloader) and restarted the machine. 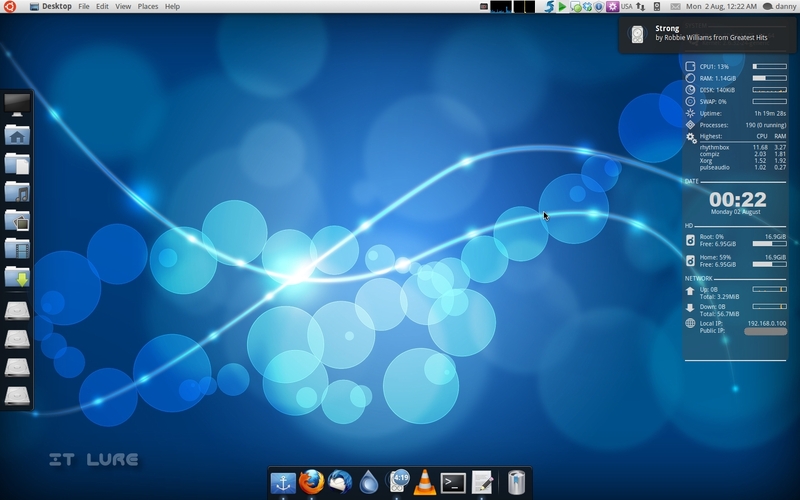 As the developer admitted, some more work needs to be put in the branding zone; for now, there is no customized plymouth animation, nor a logo to replace the main menu Ubuntu icon or the Mint logo next to "All". 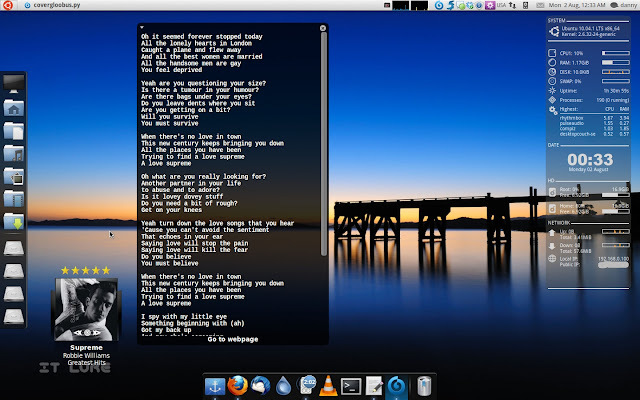 Happily, you will easily be able to recognize Pinguy from a distance: two Docky panels - bottom and left - and a geeky Conky gadget/widget/badger thing occupying the right hand side of the screen. On the bottom there are a bunch of useful app shortcuts: Firefox, Thunderbird, Deluge, Rhythmbox (sporting a cool countdown timer for the currently playing track), VLC, Terminal and the Trash. 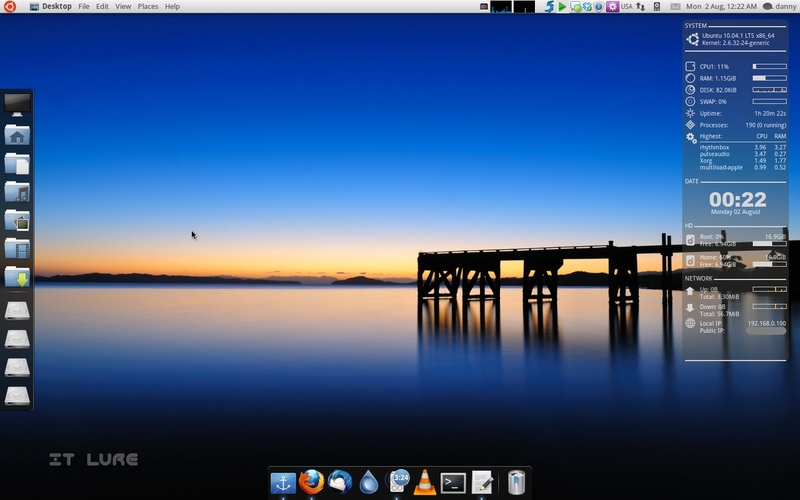 Also, the dock hosts an application switcher. How will you know an application is active? A cool, discreet light will turn on right underneath it. 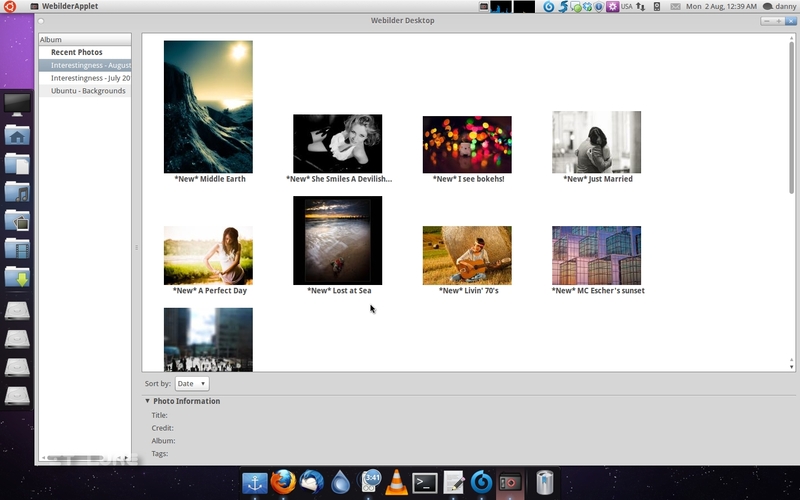 On the left, the Places menu displays the usual folders in your "Home" and also all mounted partitions. Finally, the cool Conky overlay displays the time and date, the 4 most resource-hungry processes, CPU/RAM/Disk/Swap usage, Uptime (for bragging mostly), System information, network consumption and Local/Public IPs (which I will hopefully not forget to smudge out of the screenshots before posting them :D). There is also a nice, growing, selection of wallpapers. Growing? 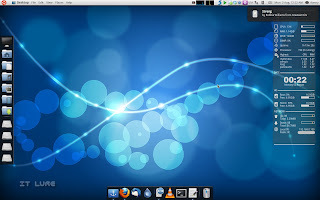 Yep, the Webilder Applet fetches the coolest images from photo-sharing sites and is also able to automatically change your wallpaper at given intervals. At the first boot, I was warned that the Docky panels will not perform as they should without the graphics drivers activated, and so, that was the next thing to do. A reboot later, the docks got a nice zoom effect as I hovered the pointer over them and windows were applied a "lamp genie" animation as they minimized/maximized. As most distributions that want to please the eyes of their users, Pinguy borrowed a few visual cues from Mac OS: the greyish theme, the spinning colorful cursor, the dock, obviously, and the globalmenu applet (which "steals" menus from their parent windows and invariably places them on the top panel - do I like it? no). 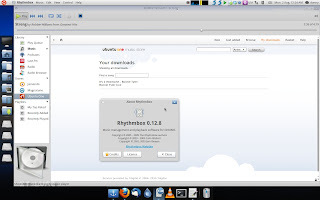 Sticking to the Firefox subject, let's slide towards the part of the article in which I tell you about the bundled software that comes with Pinguy. 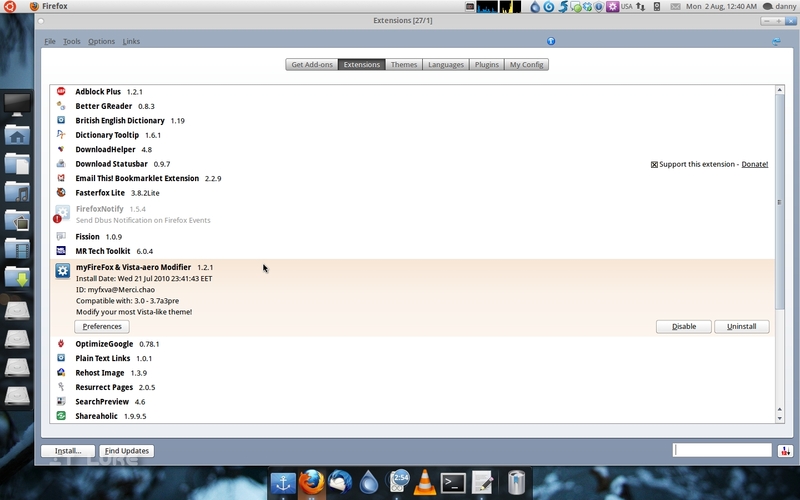 Starting with, you guessed, Firefox, I have to tell you that it ships packed with 27 (twenty-seven) extensions installed. I was almost certain that all these will equal a heavy burden, but I was quite wrong, as the browser starts pretty quickly, and on top of that, I found most of the add-ons to be quite useful: Opera-like speed dial function, smooth scrolling, Fasterfox, etc. Remaining in the Internet zone, I was quite disappointed to not see Pidgin replace the still crude Empathy. But Skype, Dropbox and Java helped get over that deception. 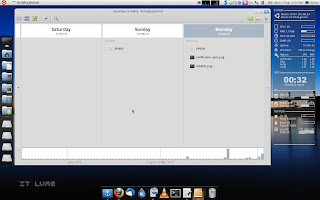 pms-linux also caught my attention, but it is useless to me, as it is a PS3 media server and I do not own a PS3. Oh, I should warn you that PS3s are evil and if you have one, you should get rid of it (I will happily take care of that for you, just ship it to my address). Let's move up a few categories in the Menu and check what's inside Door number 1 - Accessories: GNOME Activity Journal - a really nifty tool to check on what, when and how often you're using -, Cover Chooser (self-explanatory) and Cover Gloobus (a Desktop widget showing the currently playing song + lyrics! ), GNOME Do (I should really start using it again more often; really, really powerful all-things-launcher) and Shutter, the best screenshot-taking app on Linux. The "Games" category seems pretty arid, but considering the fact that PlayOnLinux is a window to a myriad of potential games, I'm not too upset. But leaving out GIMP from "Graphics"? And give Pinta instead? This is madness! Well, at least Rapid Photo Downloader is a nice addition... Right? It WOULD have been if it would WORK! I don't understand, the camera is recognized, the SD card is readable, but the app simply refuses to bridge with it. But do not fret, say I, as there is a Plan B: Showtell Photo Manager, which gladly accepted my photo offerings. In the "Office" drawer, OpenOffice couldn't have missed the party, and, along with it... Adobe Reader 9. Whaaat? Why would I want to use Adobe Reader 9 when Evince does such a great job at handling PDFs? 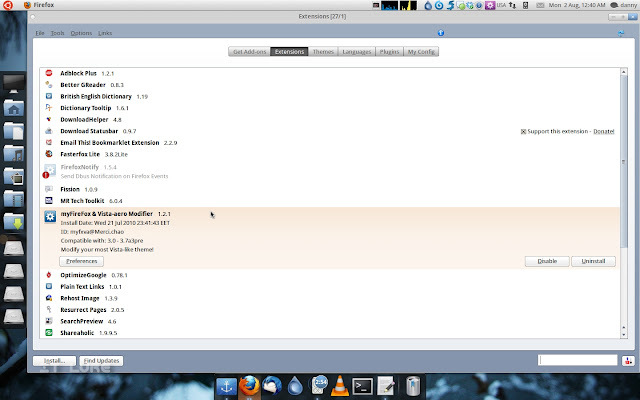 And no, I am not prejudiced against Adobe software, but the darn thing froze twice while reading a 10-page document. 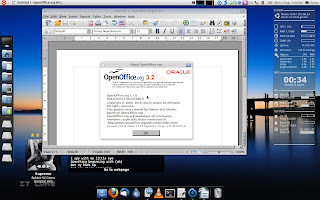 If the open source alternative not only does exist, but it is also better, why stick with the proprietary one? 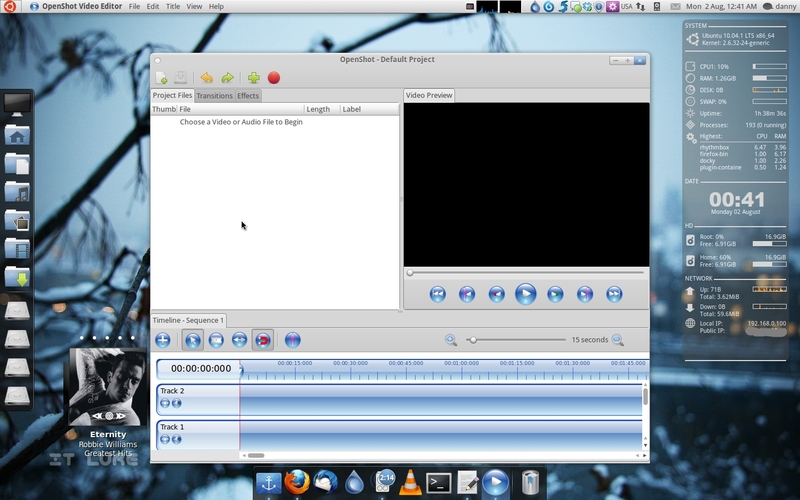 The "Sound & Video" category is well stocked: OpenShot video editor, Brasero, DeVeDe, Handbrake (one of the most awesome transcoding tools), an iPod manager, Rhythmbox and VLC. Finally, the dreaded 1 (one!) song I bought from Ubuntu One Music Store was able to make the perilous journey from the cloud, through the local Ubuntu One folder and finally into my Rhythmbox playlist. Quite the achievement... There are also a few useful system tools: Ubuntu Tweak and its competitor Ailurus, GConf Cleaner, BleachBit and Wine-Doors. I always asked myself what was in the head of the Ubuntu design team when they decided, since the 9.10 release, to so gruesomely detach the notification overlay from the top panel and leave it hanging there a few inches lower. Many thanks to Pinguy's developer for making things right. Pinguy gained a deserving spot inside my Distro CD/DVD wallet. 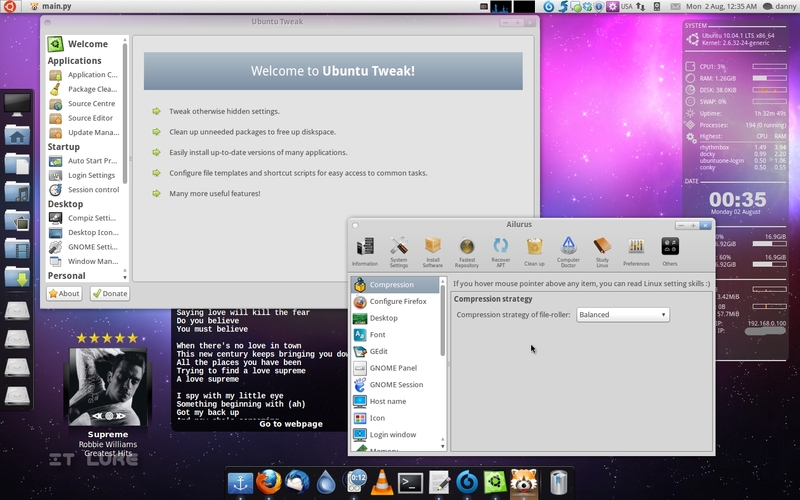 I will not hesitate to recommend it to anyone who wants a fresh, friendly and featureful Linux OS. More experienced users will most likely diss it for shoving all these applications down their throat, but if they'll give it a look or two, they might appreciate the effort. 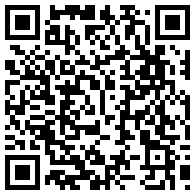 Download the now 10.04.1.2 version in 32-bit (or torrent) and 64-bit (or torrent) editions.